A team of mostly women researchers led by Mexico National Polytechnic Institute scientist Eva Ramón Gallegos just made what looks to be an incredible advancement in the treatment and cure of the Human Papilloma Virus (HPV). The Mexican newspaper El Universal reports that Ramón Gallegos eradicated 100 percent of HPV cells from all of the patients she treated who had the infection without any precancerous lesions. In total, 29 patients were effectively cured. HPV is an extremely common sexually transmitted infection that can lead to some cancers, particularly cervical cancer, and warts. 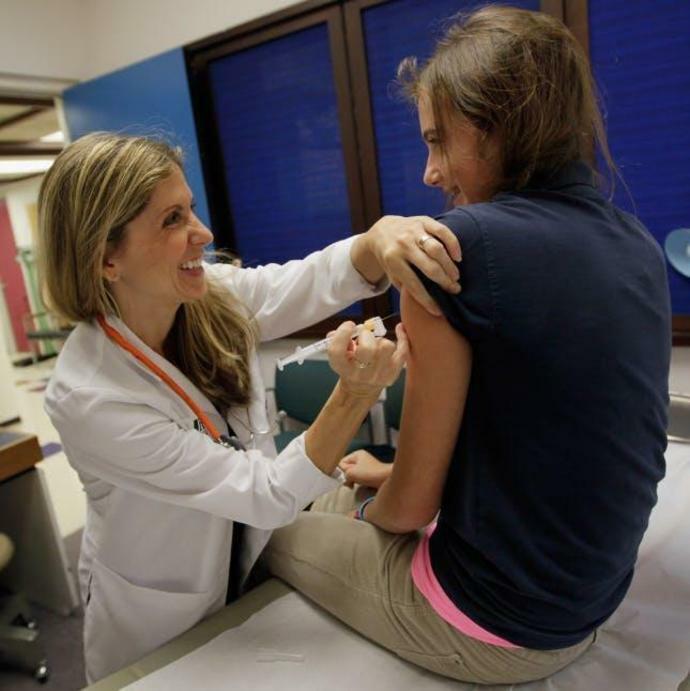 The HPV vaccine is a somewhat recent development, but has proven to be highly effective in guarding against the infection. Unfortunately, while HPV can managed in many cases with medical treatment, there is no known cure once it's been contracted - until, potentially, now. The new breakthrough in Mexico does not come from a peer-reviewed study, and its sample size of 29 patients is far too small to point to a scientifically conclusive outcome. It's also unclear as to whether the effects of the treatment would vary depending on HPV strain; there are over 100 known strains of the virus. But the finding is an encouraging one, and suggests that scientists are ever closer to being able to eradicate the virus in patients who have already contracted cancer-causing strains. And, according to a press release from the Polytechnic Institute, 14 of the 18 physicians and researchers who helped Ramón Gallegos achieve this milestone are women. El Universal reports that Ramón Gallegos had been using non-invasive cancer treatment called photodynamic therapy to treat HPV patients in various parts of Mexico. Photodynamic therapy consists of two components: a photosensitizing drug to make cells more receptive to the impact of light, and then a light that shines at a particular wavelength. Photosensitizers exposed to a specific light wavelength produce a form of oxygen that kills neighboring cells, according to the National Cancer Institute. This method is currently used by oncologists to treat malignant tumors. Building on Ramón Gallegos's 20 years of research on the effects of photodynamic treatment, she and her colleagues used this therapy to treat 420 patients in the states of Oaxaca and Veracruz. Encouraged by the results, the team then doubled the administered dosage of the photosensitizing compound to the 29 subsequent Mexico City-based patients, who were fully cured. All in all, treatment outcomes were the most favorable in HPV patients who did not have any premalignant or precancerous lesions as a result of the infection. HPV patients who had lesions saw 64.3 percent virus eradication, and patients with lesions caused by something other than HPV saw the 57.2 percent of their offending viral cells removed, as well. HPV is by far the leading cause of cervical cancer, which is expected to claim the lives of more than 4,000 women in the United States this year, according to estimates from the American Cancer Society. Cervical cancer is a significant concern for doctors in Mexico, where the illness is the leading cancer among women (the most common cancer among women in the US is breast cancer). Since the early 2000s, the HPV vaccine, Gardasil has been the front-line prevention method for HPV in both young girls and young boys. The vaccine - which now guards against nine different cancer-causing strains of HPV and has been recently recommended for adult patients into their 40s - along with regular pap smears have been pivotal for preventing cervical cancer. There is now reason to hope that the research by Ramón Gallegos and her team will lead to further testing and, eventually, better options for patients.